You already know that it’s important to play lead guitar ‘with feeling’ to make your playing sound good. But I bet that you don’t yet know just ‘how much feeling’ can be inserted into a single phrase with only a small change in the way the notes are played. Most guitarists take it for granted that expression comes from adding bends and vibrato, but rarely go deeper into other elements of phrasing. Thus most musicians leave ‘so much more’ emotion completely untapped in their soloing. I prepared a video for you to show just ‘how much more’ expression and feeling is left unexplored in your lead guitar licks every time you solo. 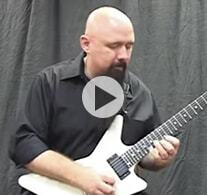 Get INSTANT FREE access to this cool guitar licks video now. Simply enter your name and email, then click the "Show Me The Video" button to enter. All of your information is always kept 100% private and confidential.